It’s happening again. Lamp-posts in Dublin city are once again festooned with images of the blood-stained terrorist Ernesto Guevara, posted up by our friends in Socialist Youth. Once again this cold-blooded killer is held up as a great humanitarian, a folk hero, an example of courage and action, a role-model to be emulated. Once again the citizenry, without batting an eyelid, walks past these objectionable flyers as though there were nothing remarkable about them, as though there were no offence offered to the public by this open glorification of a murderer and a terrorist. The image on the left is of an actual socialist youth poster displayed to the public in Dublin city in recent times. Sadly Melancholicus was unable to obtain a copy of the poster currently on view, so this older image will have to suffice. The image on the right is a photoshop mock-up created by Melancholicus. Lest readers be alarmed, he hastens to reassure them that there is no “Irish Nazi Youth”, neither is there any such body as the “Irish SS”, nor is there scheduled a public meeting in Dublin celebrating the legacy of the man who did more than anyone else to turn the final solution from an anti-semitic fantasy into a reality of blood-chilling efficiency. This poster was, of course, never publicly displayed, nor could it ever be without immediate legal consequences. The citizenry of Dublin would never tolerate such a flyer on their streets, hanging from their very lamp-posts. Yet they tolerate Guevara. Why? Why is it acceptable to murder in the cause of the Left, and not in the cause of the Right? Put it another way, what is it that makes murders committed by National Socialists so odious, whereas murders committed by International Socialists are of no account? It might be objected, particularly by his unaccountably many fans, that Guevara was different from Heydrich. Let's examine the differences. Aside from Heydrich being better dressed and better groomed than Guevara, there is not much to separate them. The similarities are more striking than the differences. Guevara was passionate about International Socialism; Heydrich was passionate about National Socialism. Guevara was a literary man and composed poetry; Heydrich was an accomplished musician. Guevara loved to ride about, cutting a handsome dashing figure on his motorcycle, firing from his pistol; Heydrich loved to take to the skies in his Messerschmitt, doubtless cutting a similarly handsome and dashing figure, swooping and diving and shooting down Soviet fighter planes. After the revolution in Cuba, Guevara zealously began terrorizing the natives; Heydrich did much the same thing to the Czechs during his stint in Prague. Guevara set himself to a larger task, spreading marxist ideology and fomenting revolution throughout South America; Heydrich also set himself to a larger task: without his genius for administrative organisation, the final solution might not have been possible—at least it would not have claimed nearly as many victims. And both were “martyred” for their respective ideologies. There is at least one difference: Guevara had much the more “hands on” attitude to slaughter, as he liked to get up close and personally involved in the deaths of his victims. Heydrich preferred to murder from behind a desk, further removed from the scene of the bloodshed. But the real difference is that the Nazis lost the war, and history is always written by the victors. National Socialism is dead, and has been fashionably loathed ever since. While it is true that there are groups of “neo-nazis” here and there, politically these will never be more than basket-cases on the very fringe, nor will they ever be able to resurrect the ideology in anything like the form it enjoyed between 1933 and 1945. National Socialism was a creature of a particular time and place. It was peculiarly German, and peculiar also to social and political conditions prevailing in the aftermath of World War I. That being so, it does not translate well to other times or venues. Should there ever be another holocaust, it will be carried out not by Nazis, but by someone else. Yet International Socialism is not bounded by such constraints of time or place. Despite the fact that since 1917 it has spilled more blood than the Third Reich (and continues to do so), it is tolerated and even regarded as chic; some naive souls even consider it benevolent and a great blessing on mankind. The politically-correct elites that dominate social, political, cultural and intellectual life everywhere in the West lean so far to the left that even a middle-of-the-road position is viewed as unacceptably right-wing, and anything further right than that approaches—at least in their eyes—dangerously close to Heydrich. It might be objected that the crucial difference between these two men is in the number of their victims, the manner in which their victims died as well as the motivation behind their actions. I do not accept this. First as to the number of their victims: is it immoral to kill by the million, but not equally immoral to kill by the hundred? Furthermore, Heydrich had the resources of an advanced military-industrial state at his disposal. Guevara lacked these resources, but can we seriously doubt that had the Bolivian army and the CIA not intervened, and had he been able to impose his will throughout South America the number of his victims would have been correspondingly increased? As to the manner in which their victims died, there may be something much more horrifying in corralling naked human beings into a gas chamber under the pretence of receiving a shower than simply shooting them in the head with a pistol à la Che, but murder is still murder. As to the third, Guevara’s animating ideology does not exculpate him of murder. It is no use to plead that Guevara’s intentions were good, and Heydrich’s evil. Neither is it any use to cite Guevara’s concern for the poor or the working class. No small number of the poor and the working class fell victim to his pistol, or to orders given to his henchmen. 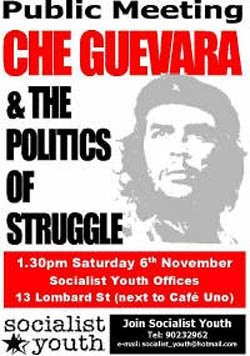 That Guevara was passionately devoted to marxism is no excuse. Marxism is an evil and toxic ideology which requires bloodletting to usher in the rule of the working class; Heydrich was no less devoted to his own ideology, which also required bloodletting in order to usher in the rule of the Aryan race. Same difference, really. Murder in order to promote a select group.